conceived for the fifth annual GETZOPHOTO held on the coast just outside of bilbao, spain, berlin-based collective mentalgassi has created four inflatable spheres that have been wrapped in an enlarged black and white photograph to look like bobbing heads. 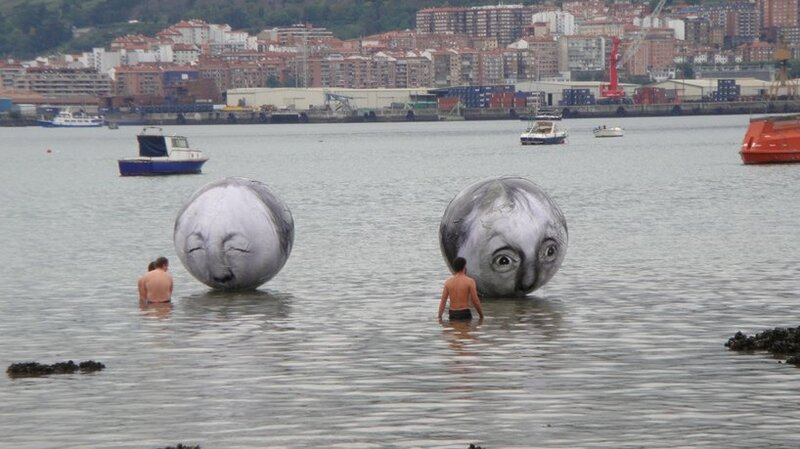 entitled ‘floating bubble heads’, the project is a response to the festival’s theme, ‘in praise of elderly’. for the project, each of the four inflatable balloons received a new skin that were laid onto the curved surface in sections. the adhesive film used photographs of elderly subjects to create three-dimensional portraits that are at once playful and surreal. the spheres were then placed in shallow waters by the coast and secured with string and cinderblocks. be sure to check out the making-of video from fermin aio at the bottom of the page. mentalgassi Getxophoto 2011 from fermin aio on Vimeo. Enjoy the video & music. Where can I get balls like that? Wonderful! I wish i have them here! I hope advertising never ends up floating like this in our harbours. Reminds me of the work by Tony Oursler.